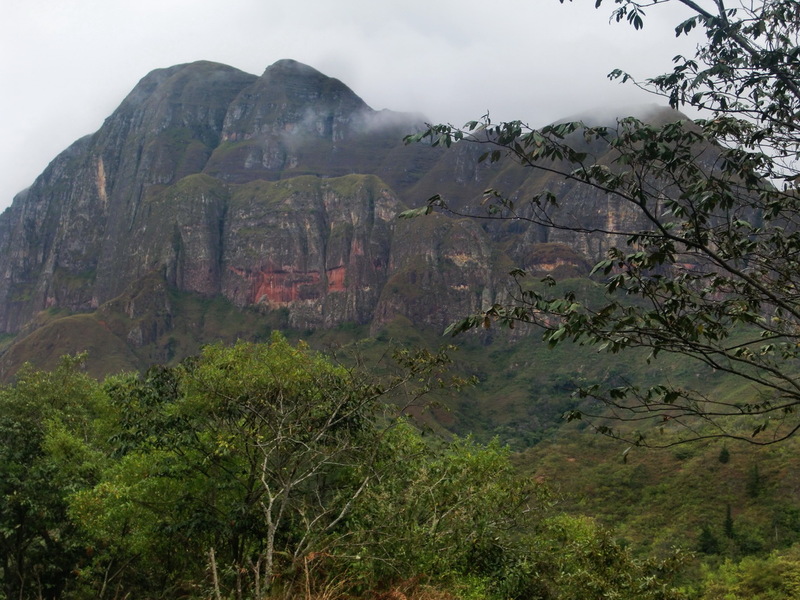 The village Samaipata is located in a marvelous environment in the first eastern ranges of the Andes. 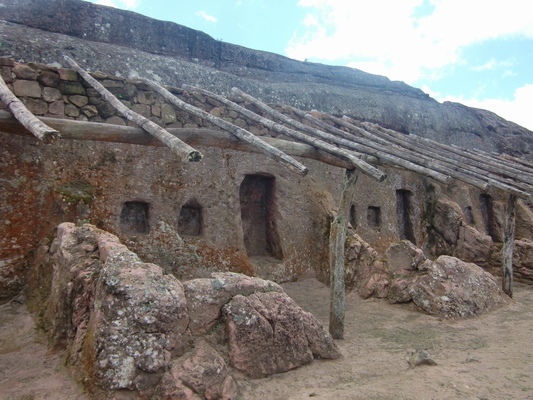 Its main attraction is the pre Inca fort El Fuerte de Samaipata, which is an UNESCO world heritage and one of the most important ruins of Bolivia and South America. The Incas used this fort as one their most outposts. East were and still are the very strong tribe Guarani, who defeated several times the Incas and prevent their further extension to East. 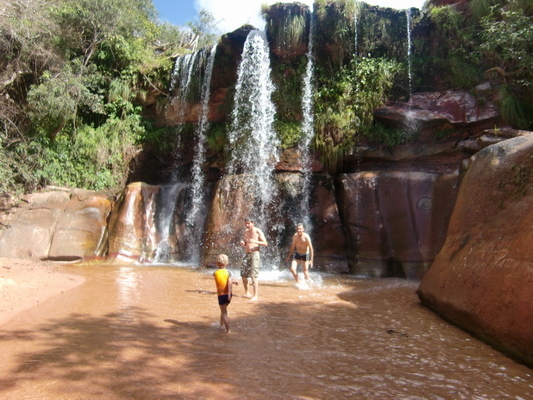 20km east of Samaipata are the Chorros de Cuevas, a paradise with three cascades, clean and cold water. It is an ideal destination on hot days to refresh and cool down. We drove on a rainy day from Santa Cruz to Samaipata mid of July 2011. The landscape became more and more mountainous and green. In Samaipata we found the wonderful campground La Vispera (www.lavispera.org - GPS coordinates: S18 11.302 W63 52.778), which is managed by Marga and Pieter, a Dutch couple living in Samaipata for more than 28 years. 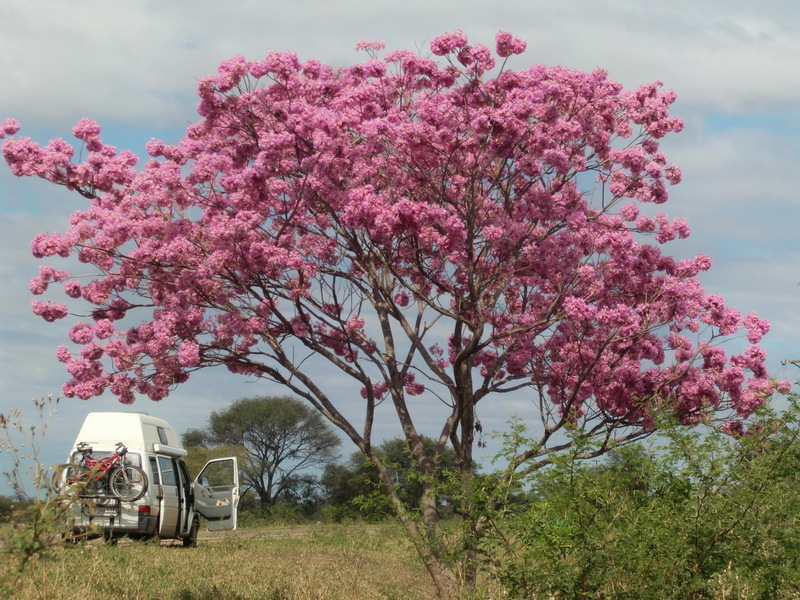 This is one of the best camping places we had in South America so far. It is located in a beautiful garden with all kind of herbs, vegetables and fruits. And the food in the cafe is delicious, for instance we got fresh baked brown bred and toasties. We met the young German couple Sarah and Steve from Munich. And there was the five year old boy Dante, who came immediately into our car. He is a Bolivian child with a Dutch Mommy - Willy and a Daddy from Guatemala - Albrik. We visited the fort El Fuerte de Samaipata with Sarah and Steve. We had a lot of fun, also in the evening with some beer and red wine - Thanks a lot Sarah and Steve, also for the maps and useful information about Paraguay. 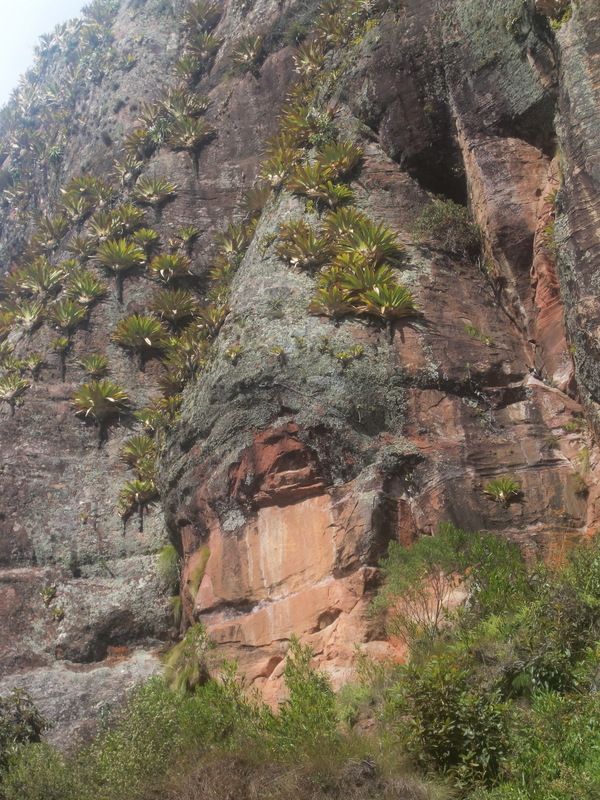 On the way to the fort is the big Inca head. 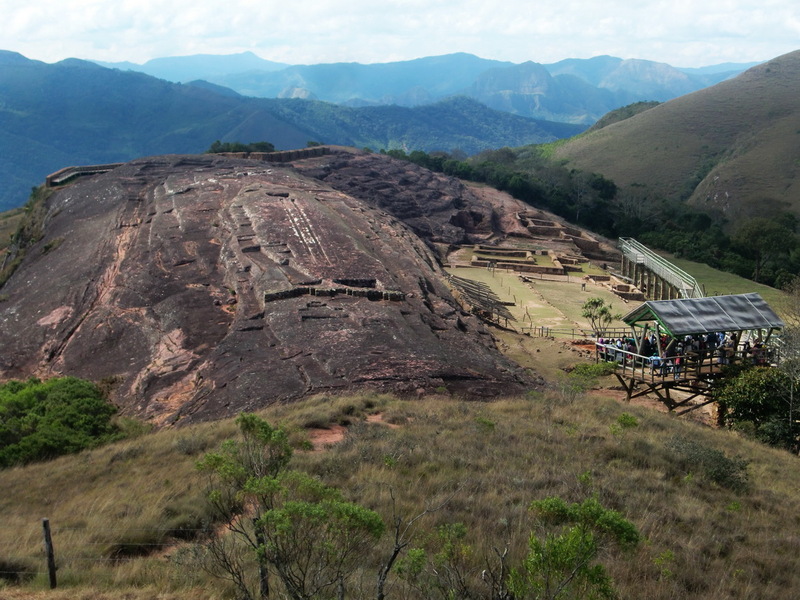 It is an impressive area with remarkable ruins in good conditions. 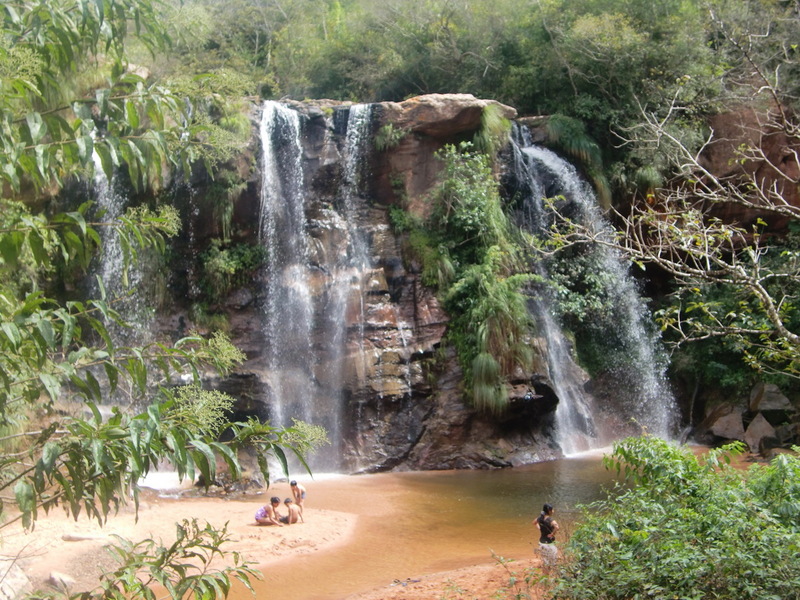 Willy, Dante and Albrik invited us to drive to the three waterfalls Chorros de Cuevas. It is a private area and you have to pay some Bolivianos for the entrance, but this area is pleasant and clean. 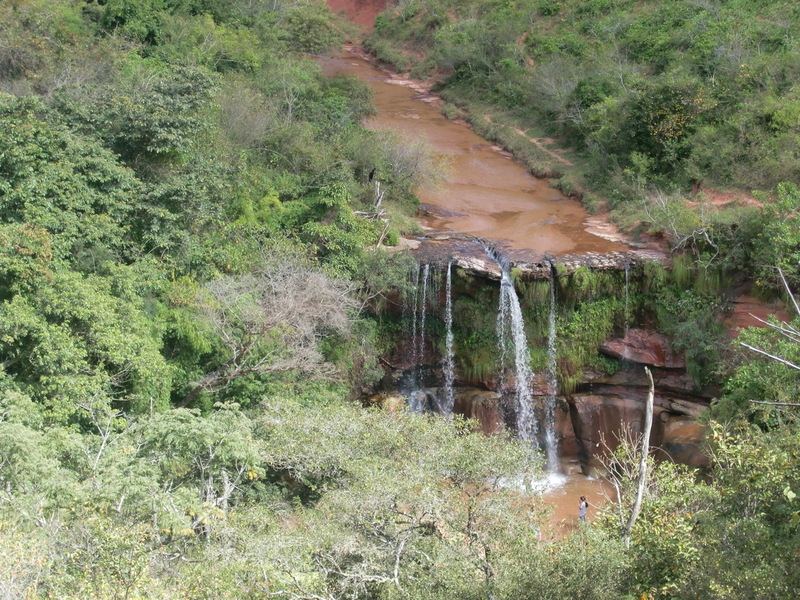 And we had detected in the Internet that there is the Geocache Cuevas-Samaipata close to the third cascade. First we were mislead by our GPS and searched on the wrong side of the stream in dense and dusty coppice. After one hour Dante was a little bit disappointed - still no treasure. We changed to other side of the river and Albrik found the Geocache in a hollow tree. Dante was happy - it was his first cache, and also Albrik's. The cache was in a miserable condition because some animals had eaten the plastic bag to protect it. We changed the bag and secured the cache with stones. 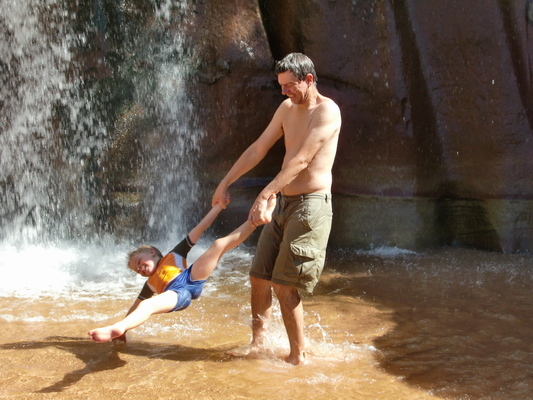 After the long, hot and dusty search we deeply enjoyed the fresh water of the third cascade. We cooked together Spaghetti for common dinner in our camping car. Dante was tired; he slept soon after he had eaten some noodles. But we enjoyed the long evening with Willy and Albrik with sufficient and tasty Bolivian red wine. We wanted to leave in the next morning. But our car had again some sickness; we were not able to start it. Fortunately Albrik helped us and towed our car off. Thanks a lot Willy, Dante and Albrik, also for the wonderful day on the waterfalls. Finally the engine started and we decided to drive to Argentine, because there we should get spare parts. We thought the starter motor or the Diesel pump was broken. On the way to Argentina we looked for sleeping places with long slopes down to start our car. It was just a problem in the morning when the motor was cold; during the day we could stop for some hours and continue without any trouble. In Argentina we fixed our trouble with the car, but not in the first run. We stayed the night in the first town after the border, Tartagal, directly in front of a Volkswagen service. Fortunately our car did not start in the next morning. They found that the heater plugs did not get current for preheating the diesel. Consequently the diesel was cold and did not spark. An enormous amount of current in the range of 50 Ampere for few seconds is mandatory for the five heater plugs. Obviously some defect of the electricity, maybe the switching relay for the heater plugs. They installed a cable to the steering wheel with a button. We should push this button for few seconds in the morning for preheating. It worked perfectly, also on the next morning. Three days later the engine smoked after pushing the button - the newly installed cables were burning more or less. It turned out that these cables were much too weak for 50 Amperes. Fortunately we found thicker cables and Alfred had to do the installation again. Thanks for your wonderful review on La Vispera in Samaipata. 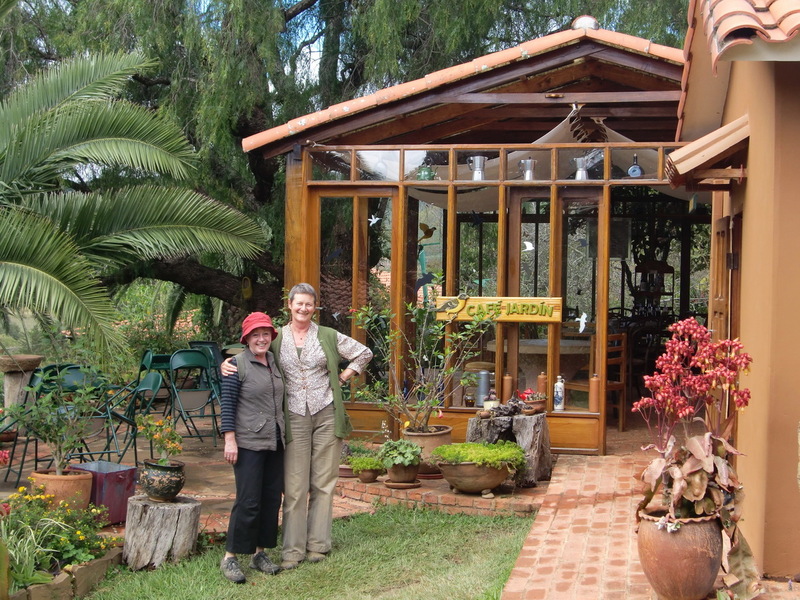 Beautiful photos and empathic report on your visit to us and the region. Always welcome back in our little paradise. Take care, keep on enjoying your trip and have a Good and Happy life.